USB - Universal Serial Bus - is a standard for connecting additional equipment to your computer, like printers, scanners, webcam's, digital camera's, keyboards, mouse, harddisks, etc. It was supposed to solve all the confusion and issues on PC ports. Well it didn't ... as with all standards: confusion became even worse. Apple introduced a similar product years ago called FireWire, the direct competition of USB 2.0. That's not all, within the USB standard we also have USB 1.1, USB 2.0, HiSpeed, FullSpeed, and LowSpeed. Tip: not all Windows versions can deal with USB ports, for example Windows 95 and Windows NT 4.0. Tip: Keep in mind that your BIOS, by default, does not support a USB keyboard. Menaing: that if you boot your PC while having a USB keyboard, you will NOT be able to modify anything! As a matter of fact: you won't even be able to get in to the BIOS! So first sue your old PS/2 keyboard to go into the BIOS and set "USB Keyboard Support" to enabled! 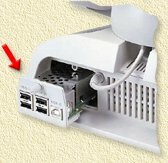 Most PC's have USB ports and we use these port almost the same way as you can see in the image below. Usually hooked up to a scanner, printer or keyboard and mouse. While connecting these, you probably did not think what and how. You just plugged it right in. USB uses two types of connectors, a so called A connector and a B connector (USB 1.1 and USB 2.0 both use the same connectors!). The USB A connector is a rather flat connector which is being plugged into the USB contact of your PC (or in a HUB). Most USB enabled equipment use the USB B connector. The B-type connector is more of a square connector. An USB HUB can be used for splitting a USB connection into multiple other connections. USB HUBs can be found in different shapes and sizes. From you PC a USB-cable runs to a little box, which allows connection of additional 4 USB devices (some have more, some have less). The fun-part is that on a hub, you can connect another hub and have even more connections. Just basically as you would do for a poweroutlet. Just as you would use a standalone hub, this type of hub can be integrated into your PC's monitor, saving space. However: usually not saving money. There are also hubs that can be placed into an empty floppydrive bay in your PC. This type of hub brings some USB connection to the front of your PC, which is very pratical when your using USB for example for your digital foto-camera. So everything works just dandy, but what are our limitations? Caveats? etc? Let's get confused here! For USB there are currently two main standards: USB 1.1 and USB 2.0.
to be honest: I have never seen a USB USB 1.0 device/standard so I'm not sure if that every made the stores. USB 1.1 uses two speeds: LowSpeed (1.5 Mbps, app. 192 Kilobyte/sec) and FullSpeed (12 Mbps, app. 1,5 Megabyte/sec). The last one gives me a feeling of being ripped off. It is highly confusable with USB 2.0. LowSpeed usually for keyboard and mouse. FullSpeed usually for printers, scanners, harddisks and webcam's. Here you will find the biggest confusion of them all: "Hi-Speed".... is this slower than FullSpeed or not? Hi-Speed is MUCH FASTER: 480 Mbps (app. 61 Megabyte/seconde). So how about this speed then? Take a look at this table below, which I created to show you the difference betwwen USB 1.1 LowSpeed/FullSpeed and USB 2.0 (= HiSpeed) compared with other interface types. So what interface should I use then? * An external harddisk is faster using USB 2.0, however knows it's ups and downs. Firewire on the other hand is a bit slower but guarantees a minimum transferrate. That's why one should go for Firewire when using the external harddisk for Audio/Video purposes. 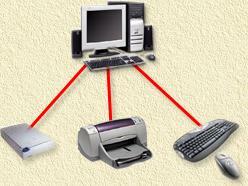 ** Card Readers: readers for Compact Flash, MemoryStick, Smart Media, etc. So you have some USB enabled devices ... how should you connect them? When connecting a USB 2.0 device onto a USB 1.1 connection, then this device will go only as fast as the USB 1.1 standard. Not faster. So why spend additional money - buying an USB 2.0 device - on a performance I won't get. I would have to say: invest in USB 2.0, since more and more computers are able to work at these new speeds. If you hook a USB 1.1 device to your USB 2.0 enabled PC, then the device will not run at USB 2.0 speed. Only at USB 1.1 speed. In the drawing above, you will see what happens. 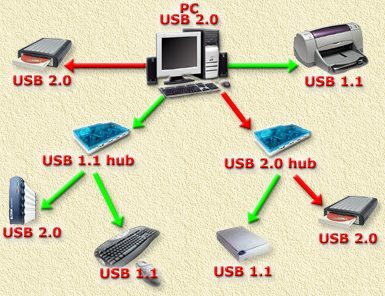 Connecting a USB 2.0 device onto a USB 1.1 hub, will result in USB 1.1 speeds, no matter if the device before the hub uses USB 2.0. So pay attention when hooking up stuff! This also means that if your PC can only handle USB 1.1, than this implies that all connected devices will work at USB 1.1 speed!